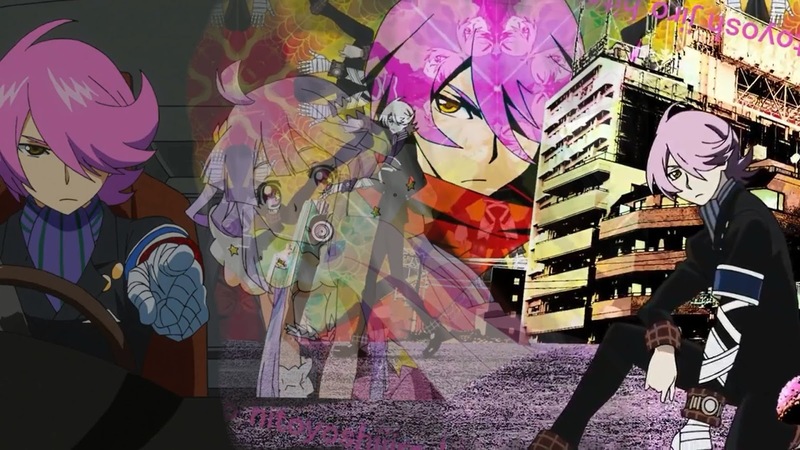 Concrete Revolutio : Choujin Gensou the last song is the second season of Concrete Revolutio and so far has proved to be one of the most original of this seasons limited original anime. It premiered last year following the boom of superhero anime which can be accredited to Marvel blowing up the Superhero genre in mainstream cinema. It was praised for being an original series and for taken a look at anime superheroes from a different angle exploring the greyer moralities whilst still being fun and creative. Studio Bones has done both of the seasons , a great studio who are also working on the equally great Boku no Hero as well as the less noticed Hero Man. “Concrete Revolutio: Choujin Gensou takes place in an alternate future during the year Apotheosis 41. Earth has been inhabited by an array of beings once thought to be pure fiction: ghosts, robots, aliens, cyborgs, you name it. This horrific reality is not something that many can accept. To keep the civilian population from panicking and to protect humanity from any new threats that may arise, the various governments of the world have decided to keep this information secret. Despite the anime superhero genre being revived lately by the recent smash hits : Boku no Hero and One Punch Man Concrete is the only one that has so far attempted to create a large scale story spanning over more characters and locations. If you take One Punch and Boku no as a Batman graphic novel ( by comparison purely ) then Concrete Revolutio is Watchmen with a fair bit of X-men thrown in for good measure. The story is set up to allow countless encounters and plot points , not being tied to a manga either adds to the writers freedom. So I think the rather standard plot about being chased by the government has laid out a decent foundation to be filled out by the writers. If you google , Concrete Revolutio - confusing , then you’re sure to get a good amount of hits. Incoherent and jumbled up time-lines are very common in western TV and films but it’s something that has never been explored in mainstream anime , I presume due to the stereo-type that anime is only for small children. But it’s nice to see expanding into Japanese media as well. The questioning of morality , government and other philosophies is a good way of fleshing out the show and compensates depth for the goofier moments and characters. It’s handled incredibly unsubtly though. The soundtrack is unique and quite clearly thought out to match what the show needed. It mostly stays in the background adding to fight scenes. Nothing about it is overtly “ superhero “ however. I do have a problem with the voice actors , even though they’re all very talented they just aren’t able to portray the scale and size of the supposed characters they playing. I just don’t buy that they’re , a detective or a giant mech but a voice actor. Now the cast is a collection of very fine award-winning actors so this might be a problem with the direction. I suspect they were told to downplay themselves as the show tries to be more serious than the average superhero anime. The art is , no surprise , really good. There’s a great utilization of colour and especially admirable is how the lighting is done 100% through the artwork rather than CGI onto the pre-existing frame.I don’t know if you’ve noticed but it’s extremely distracting , especially in SOL comedies where this is most prevalent , to have a simple two colored tone with a glaring obviously cgi ray of light which is usually far too HD to fit the rest of the show. The art-style allows for some exceptional character designs with everything from mechs to goofy dog people the simple colouring and toned down clothing keeps them from being too outlandish and sticking out during the darker moments. And it annoys me to no end that I have to say this but the superhero show has better mechs , all done 2d by hand than every single mech show this season. If a show whose focus is about 50% on mech battles then how come designers think it’s okay to just copy+paste a 3d model onto a pre-existing 2d background when dealing in a show tailored specifically to mech fans ? Although the character designs are amazing and the mechs are stunning the characters are rather predictable , I think this a drawback of dealing with darker tone. One Punch has a main character who has quickly skyrocketed into recognition and adoration but one that would never work if you paired him with themes of government oppression and when civilian violence is justified. I present this shows recommendation with caution. It’s a very mixed bag which dabbles in a bit of everything but only successfully pulls off one or two of those. If you find Boku no Hero Academia too childish and bright for you this season then I’d say turn to Concrete Revolutio , also for any mecha otaku like myself this show will successfully any post 3DCGI depression you might have after seeing what this season had to offer. Otaku Giveaways © 2015. All Rights Reserved.